In this section, I will examine the growing body of circumstantial evidence, in the form of almost countless ancient illustrations, which suggest that both the ancient Greek and Roman versions of the kithara (the larger wooden lyres favoured by the professional musicians of Classical antiquity and from which word we actually derive the word "guitar") had an incredibly advanced vibrato mechanism - some 2500 years before the advent of the 'whammy bar' of the modern electric guitar! The general result of my investigations, reveals that since these instruments are so far away from our present experience, even with all the evidence presented, in order to try and actually interpret this evidence, all we really have, are good old fashioned argument and counterargument! Firstly, some background. I have recently become interested in the little-discussed topic of the various shapes of lyre bridges that were used in antiquity, as the shape of the bridge has profound implications on the tone the lyre - many ancient illustrations of lyre bridges seem to depict a flat, bench-like bridge, rather than the "A" shaped bridge which is generally used on most attempts at making replica lyres in modern times. The most important implications on the tone a bench-shaped bridge would make, is that the vibration of the strings on the wider bridge top would buzz, unlike the clean, harp/guitar-like tone an "A" shaped bridge produces. The most intriguing evidence that at least the Biblical Kinnor may have had such a bridge is the Hebrew word for melody, "ZMR" (pronounced"Zemer") - this could well be an onomatopoeic word, sounding itself, like the buzz created by the strings of the Biblical lyres? "Javārī, (also: 'joārī', 'juvārī', 'jvārī' (alternately transcribed 'jawārī', 'jowārī', 'joyārī', 'juwārī', and 'jwārī')) in Indian classical music refers to the overtone-rich "buzzing" sound characteristic of classical Indian string instruments such as the tanpura, sitar, surbahar, rudra veena and Sarasvati veena. Javari can refer to the acoustic phenomenon itself and to the meticulously carved bone, ivory or wooden bridges that support the strings on the sounding board and produce this particular effect. 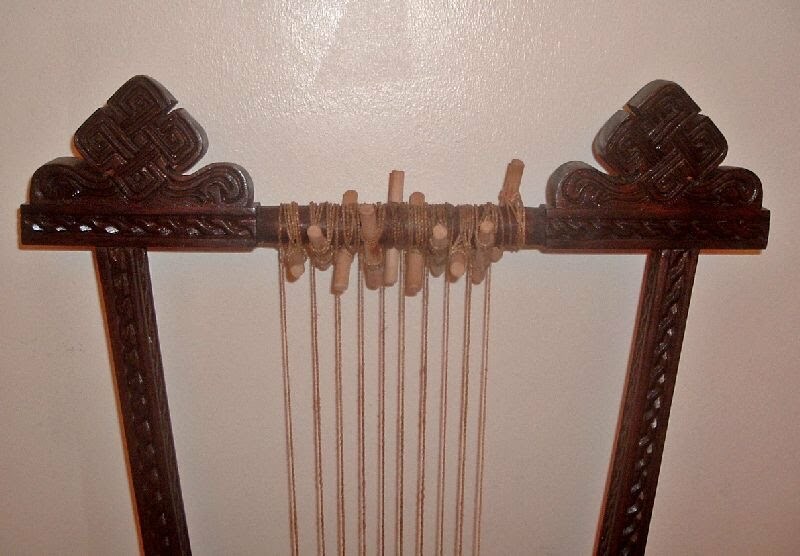 A similar sort of bridge is used on traditional Ethiopian lyres, as well as on the ancient Greek kithara, and the "bray pins" of some early European harps operated on the same principle. A similar sound effect, called in Japanese sawari, is used on some traditional Japanese instruments as well." Note the clear reference above, to the shape of the bridge depicted on the ancient Greek kithara and the Ethiopian lyres (specifically, the begena), still played in Ethiopia to the present day! AN ANCIENT ROMAN VERSION OF THE "WHAMMY BAR"? 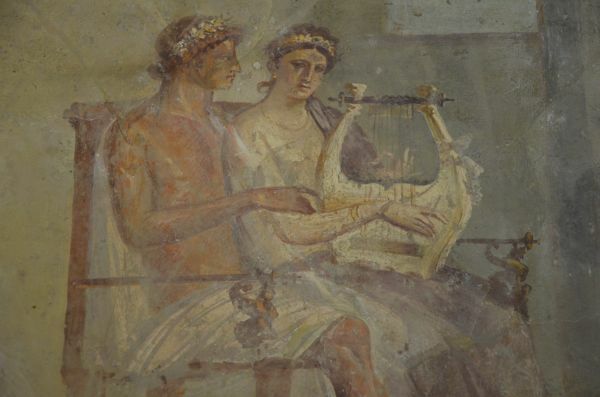 "The really ASTONISHING thing about this wonderful fresco from Herculaneum is the obvious presence of what could only be described as a "whammy bar" on the lyre! Not only are we looking at a whammy bar, but the left hand of the child (possibly a cupid) who is playing the instrument is actually pressing down on it as he actively strums the strings with the plectrum. The lyre has 14 strings that lie over a flat bridge, and wrap onto what appears to be a spring mechanism. The artist is showing us a good deal of detail and you can see that the whammy ensemble consists of two parts: a ' ] ' shaped upper bar to which the strings are attached with two slightly raised arms, and a lower part that acts as the spring. The action would be similar to two pairs of tweezers lying on a table, with their open ends joined with a pencil. Push downward on the pencil and the "tweezers" close. Release the pressure and they open up again pushing the pencil back up to its original position. The artist, obviously a master painter, has even given us enough perspective to see the upward curve of the feet of the lower part of the spring (i.e. the tweezers) in the open position. By depressing either one of the two upper whammy arms, the pitch of the strings would sharpen, possibly by as much as a semitone. This would facilitate all sorts of interesting ornaments and effects, including vibrato. Another interesting detail the artist has given us is the color of the whammy device. In contrast to the rest of the instrument, it is quite evidently made of a white, shiny metal - possibly silver. This is a fascinating discovery and I have no doubt whatsoever that what we are looking at is what I have described above. Here is my own sketch, based on the fresco, showing the mechanism. The Romans used this type of spring for all sorts of other things: box lids, tongs, hair pins, latches, locks, tweezers, forceps, medical devices, even other musical instruments, but this is the first time I have heard of its being used on a lyre"
There is a detailed PDF of a paper by Pavel Kurfurst, "The Ancient Greek Kithara (1992)", which explains more evidence for this concept of this spring-loaded vibrato mechanism on the ancient Greek Kithara in more detail - this article can be viewed here. “Basically there were two means of achieving this, each qualitatively different. In the first — the commoner, to judge by the iconograms — the player used his chin, nose or cheekbone to push against the disc fixed to the end of the crossbar, in this way moving it and the weights away from himself. At the same time, he kept the instrument in the same position relative to his body. At first the kinetic inertia of the relatively heavy weights would be too great for the force being exerted by the player, but once this had been overcome it would itself contribute to the smooth and relatively slow movement of the crossbar. When playing the instrument in this way, the kitharistes hat two possibilities. He could either shift the crossbar to certain points, thus producing precise tones (within the compass of the THE ANCIENT GREEK KITHARA), or achieve a glissando effect by continuing to move the crossbar smoothly. At the same time, the spring mechanism and the continuous pull of the strings would act to return the crossbar to its position of rest. With the second method of playing the kithara, a tremolo could be created, with either very slight variations in pitch or larger vibrations covering a range up to approximately three tones. The speed of vibration of the tremolo would have been proportional to the range it covered: the less the variation of pitch, the more rapid the tremolo and vice versa. When using this method, the kitharistes would set the weights oscillating by moving the whole instrument at right angles to his body, in this way making use of the inertia of the weights, which would have a tendency to remain in their initial position. In this section of his paper, Kurfurst theorised that the vibrato mechanism could be operated by the momentum of the player maybe throwing the kithara forward. I would tend to disagree, due to my own practical experience of actually playing one – due to the strong downward pull of the combined tension of the strings (even with low tension gut, this would still be well over 100 Lbs), in order to let inertia displace the yoke and set into operation the spring vibrato mechanism, the discs either side of the yoke would have to be very heavy and made of metal: speaking as a practical musician rather than a musicologist, this would render the beautiful light and resonant construction of the kithara so top-heavy that the instrument would be virtually unplayable! Also, if metal discs were used, then these would have survived the ravages of time, and many such discs would have been found in ancient Greek grave goods, where it is likely that revered musical instruments such as the kithara may well have been placed (surviving examples of the fragments of ancient Greek tortoise shell lyres have been found as grave goods, for example the remains of the Elgin lyre preserved in the British Museum) – no such curious metallic discs have ever been found in any grave goods, in any ancient Greek tomb so far excavated. In the image above, in the far right corner, directly above the curved spring-like structure, is what certainly appears to be something which could be interpreted as being a hinge! POSSIBLE MENTION OF THE VIBRATO MECHANISM OF THE KITHARA IN ANCIENT TEXTS? 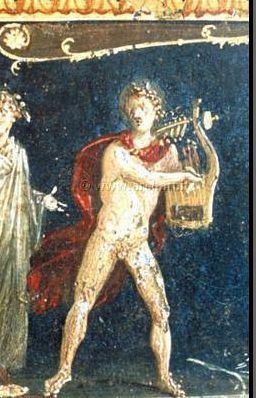 "...And if any boy engaged in classroom buffoonery or attempted to torture the music by singing in the cacaphonic, newfangled style of that awful lyre player, Phrynis, (971: Phrynis introduced καμπή [bends] of harmony and rhythm into the traditional music of the kithara), he was given a damned good thrashing for deliberately perverting the Muses!" FURTHER VISUAL EVIDENCE OF ARTICULATED ARMS ON THE ANCIENT GREEK 'PROTO-KITHARAS'? "Below is a picture of a seven stringed lyre painted onto the famous limestone sarcophagus known as the "Hagia Triada", now in the Heraklion Archaeological Museum in Crete. This instrument is Minoan, and is 1000 years older than the Golden Age kithara we are familiar with. Notice the unusual construction of the two pillars of this instrument with their large ring-shaped, curiously jointed, configurations. Remind you of anything? To my eyes, this instrument is obviously articulated, just like the kithara of 500 B.C. I have looked over the writings of archaeologists and musicologists who have examined this marvelous artifact, and not one of them has suggested that the ‘O’ rings have any purpose whatsoever beyond simple decoration. EVALUATING THE EVIDENCE FOR THE DEVELOPMENT OF ARTICULATED ANCIENT GREEK LYRES? The circumstantial body of evidence for articulated ancient Greek lyres is so extensive and whose prototypes dates back so far into the ancient Greek archaeological record, that to me, applying the philosophical method of Occam's Razor here, given the available overwhelming circumstantial archaeological evidence we have in the form of countless, detailed ancient illustrations, the simplest explanation for these complex structures seen on these ancient Greek lyres, is that the ancient Greeks had developed an intricate vibrato mechanism based upon the idea of articulating the arms of their lyres, refined over a period of at least a thousand years, before reaching its most advanced form, in the glorious kithara of the Golden Age of Classical Greece. From the point of view of epistemology (the philosophical theories on how we are able to gain knowledge), in order to gain knowledge about any facts, we must already have a certain amount of experience of similar facts in order to interpret the new facts - with no experience of hearing or seeing an ancient Greek or Roman kithara performed for over 2000 years, we are in a very similar position to our 'future archaeologist scenario' in his inability to interpret the fact that the 'curious circular structures' seen on late 19th century bicycles were, in fact, the things we currently call 'wheels'! ARGUMENTS AGAINST THE ROMAN"WHAMMY BAR" HYPOTHESIS? As with interpreting any ancient illustration of something which is no longer any part of our own every day lives anymore, there are always going to be alternative interpretations to any particular hypothesis, particularly in the field of archaeo-musicology! "I have to confess I am not yet convinced by the Whammy bar Hypothesis, it has been proposed before on Kitharas ,where support brackets get interpreted as springs and the end clasps on the string bar as knobs , In this example I can only really only see a metal tailpiece and its connections front and back to the soundboard both sides for strength(12 string lyre after all) Gut strings are not as amenable as steel strings to being stretched back and forth and are more finicky with their tuning." "I have read many of the fanciful theories about the various types of ornamentation on kitharas, but there are two elements here (IMHO) that make this Roman lyre unique. First of all, the two upward pointing raised arms on the top bar that would serve no purpose if the bar were simply there to attach the strings. They are not attractive or ornamental in any way, and their position would not aid in stabilizing anything. 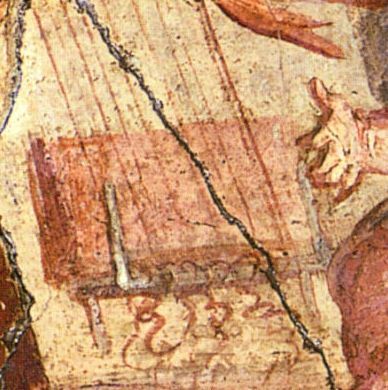 The second element that I find most striking is that the hand of the lyre player is clearly manipulating one of the raised arms. The artist's brushstrokes are masterful, and there is real, identifiable ACTION in the motion of the left hand of the player. If you were to run the painting as if it were a motion picture in your imagination, you can almost see the little fellow pushing down on the arm! Yes......I guess the key word here is IMAGINATION. In the absence of an actual example of such a lyre, we can never know for sure." "I think the cupid character is strumming or playing with a plectrum and supporting the lyre, (this mirrors the other character who is holding the lyre and playing too), rather than operating a device. Its compositional, but yes, to have some actual remains... sigh." Intrigued by all the varying arguments for and against the vibrato mechanism of the kithara of ancient Greece and Rome, I sought to seek a more academically informed opinion and received just that, from Professor Stefan Hagel. Regarding the vibrato mechanism of the ancient Greek kithara, Hagel kindly pointed out to me an academic paper which I knew nothing of, entitled "The Arm-Crossbar Junction of the Classical Hellenic Kithara" by Stelios Psaroudakes. In short, this fascinating paper refers to an actual 3D sculpture of an ancient Greek kithara, found as part of the Parthenon Frieze, in which "The intersection of the arm with the crossbar is carefully modelled, and so is the elaborate snake-like construction underneath it." This unique 3D ancient depiction of the kithara is unique, in that it clearly shows that instead of there being a moveable, 'floating' yoke necessary for a vibrato mechanism, "It is here shown clearly that the crossbar surrounds the arm, in other words the arm penetrates the crossbar. Therefore, the upper arm of the kithara would have undoubtedly been solid, a wooden plank, and not a deep, hollow resonator, as is unanimously believed." "The right end of the base of the upper arm rests on the “bow”, which in turn is propped up by the elaborate system “capital-column-basehead-horseshoe buttress”, which leans against the inner wall of the lower arm. Undoubtedly, the function of this system is to provide reaction in the opposite direction to that of the tension in the strings." In other words, according to this paper, the spring-like structures were simply used to reinforce the strength of the weak, inwardly curving arms of the kithara, by providing an equal and opposite recreation to counteract against the downward pull of the strings. IF THIS SPRING MECHANISM DID EXIST, WAS IT USED FOR VIBRATO OR PORTAMENTO? If, however, the circumstantial visual and literary evidence for some form of spring-based mechanism being designed into the body of the ancient Greek kithara is true, then from my own practical experience of actually performing with the imaginatively recreated mechanism on my Luthieros ancient Greek kithara, in my own opinion, I think that this mechanism would more likely have been used to create sliding 'portamento' effects to imitate precisely the same singing style descriped by Aristophanes in "Clouds", (line 971) as described earlier; rather than to create vibrato effects - vibrato is much more effectively created on my replica kithara, by simply applying light fluctuating pressure with my left hand fingers on the non-vibrating portion of the low tension gut strings of my kithara; directly above the bridge upon which the strings rest. This is a far more effective means of creating vibrato on my kithara, than attempting the awkward proceedure of having to suddenly raise the entire righ arm and hand to the top of the arms of the kithara, in the middle of playing a tune, in order to operate the spring mechanism whilst finger plucking the strings with the left hand - which in itself, inevitably causes annoying noises of mechanical squeaks whenever the mechanism is operated! These mechanical squeaks are also far less noticeable when sliding portamento is created via the kithara spring mechanism. THE FUNCTION OF THE SASH DEPICTED IN MOST ANCIENT ILLUSTRATIONS OF GREEK KITHARA PERFORMERS? The same vertical sash is also clearly present in the image above. I think that instead of playing any practical role, (unlike the cord known as the 'telamon' which was used as a hand-strap to hold the instrument), the fact that the sash was often also quite ornate, may imply that it actually was an indication of the kithara player's status as a professional musician. in much the same way that a Judo belt indicates the proficiency of a Judo athlete? If there are any Classics scholars out there who could verify my theory regarding the sash, from any snippet of ancient literature which mentions it, do please let me know! 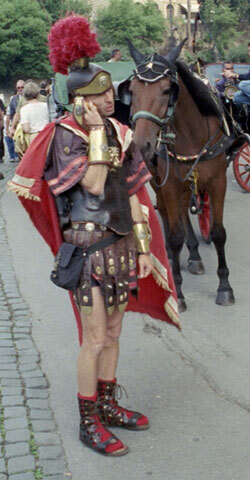 DID THE ROMANS ALSO INVENT THE 'WAH WAH' PEDAL? 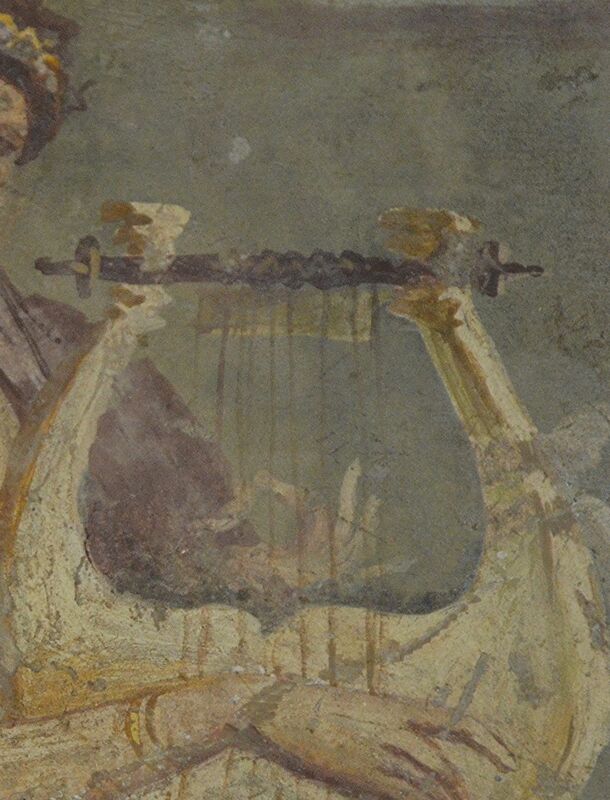 Another fascinating observation about the incredibly detailed illustration of a Roman kithara on the Herculaneum fresco which I mentioned to Peter, are the 4 pointed structures, 2 of each being depicted either side of the strings - could these be adjustable sound hole covers? As well as inventing the world's first whammy bar, it also might just be possible that the Romans also invented the first 'wah wah' pedal! Maybe a more likely an explanation for these pointed structures inserted into the sound holes of the Herculaneum cetra, could be that they are mutes, similar to the mutes inserted into modern brass instruments? Either way, these structures prove that there was certainly nothing 'primitive' about the musical instruments of ancient Rome during the 1st century CE! 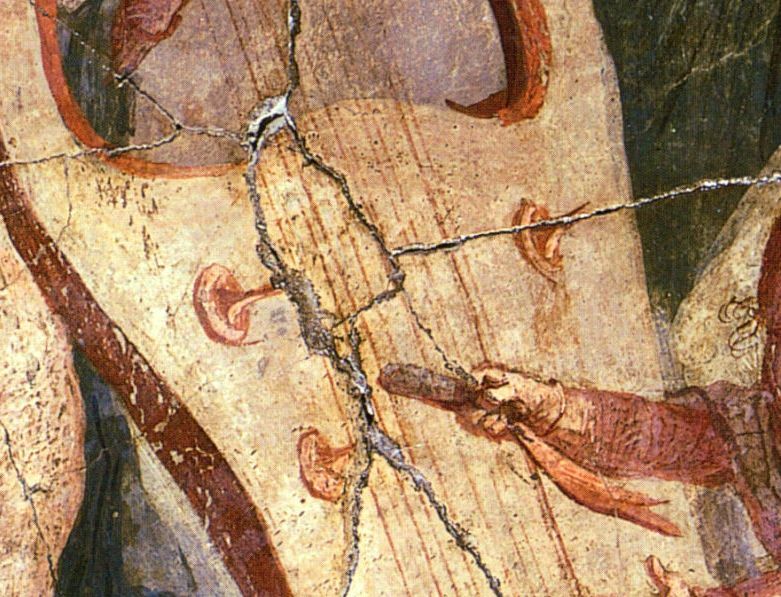 DID THE ROMANS INVENT THE FIRST METAL MUSICAL STRINGS? This squiggly curl is not typical of gut strings, but it is typical of metal strings (in this case, probably bronze or silver) that have been forced through the tiny holes of some kind of drawing/shaping device in order to make them round and of consistent gauge. I believe it is likely that this instrument was strung with metal. If it was, it would make double courses more probable because there is more tension in metal strings and two strings vibrating in close proximity have less chance of interfering with one another...I believe this instrument was a seven note lyre with double courses totalling 14 strings. It is quite possible that the instrument was strung with brass since the Romans possessed wire-making technology. This would have permitted a louder sound, a narrower amplitude of string vibration, and would have facilitated the technique we associate today with the “tremolando” of a mandolin"
The possibility that this unique instrument may have had double courses of metal strings, suggests that one of the likely playing techniques for this kithara, would have been to produce the tremolo effect, so suited to double course string instruments such as the mandolin. Indeed, the renaissance Italian cittern, a mandolin-like instrument which also had 7 double courses of strings, was called the "cetra", directly after the original name for the Roman kithara, quite possibly for this very same reason, regarding the tremolando technique featured on both of these instruments? DID THE ROMANS INVENT THE FIRST 'TRUE' FRICTION TUNING PEGS? 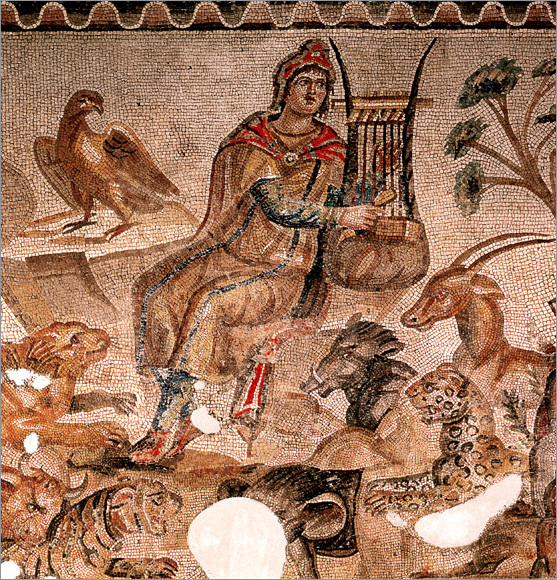 All other depictions of lyres from antiquity show the more primitive system of either just leather wraps or leather wraps over which the strings were wound and sometimes with the addition of tuning sticks inserted into the string spool, which were used to adjust the tension of the strings. In contrast, the Roman cetra had the first 'true' friction pegs with which we are familiar with today in string instruments such as the violin - rather than the tuning pegs merely being lashed to the instrument, a hole was bored into the body of the instrument, into which the 'true' friction tuning pegs were permanently inserted. The pictorial evidence of what appears to be the possible use of metal strings (as mentioned earlier), rather than the usual gut, silk or other natural fibre musical strings commonly used at this time in antiquity, certainly gains added weight by the use of friction pegs on this instrument - only true friction pegs could hold and maintain the much higher tension of metal strings. Also, any vibrato mechanism similar to the electric guitar's 'whammy bar', would only really function properly on higher tension metal strings - lower tension gut or natural fiber strings do not have the necessary tension to return properly to their original pitch after the use of such a vibrato mechanism on them. "Just because a lyre or lute has a bench shaped bridge does not mean that it was constructed that way in order to produce a buzzing sound. On the other hand, it is impossible to produce the buzz without a bench shaped bridge. The design and type of bridge used on a lyre is going to be a major factor in determining the tone of the instrument. There are no existing examples of bridges for ancient Sumerian lyres but what we do have are artists' depictions of these lyres in action. One such illustration is on the large, gold, bull-headed lyre of Ur. This instrument was discovered along side the silver lyre in the great death pit excavated by Sir Leonard Woolley in 1929. Like the silver lyre, the front of the gold lyre has an intricate decoration of carved and etched shell inlay, and one of its four panels shows a donkey playing a bull-headed lyre. While a certain amount of license has to be given to the artist, the instrument the donkey is playing clearly has a wide, flat bridge, similar to the kind of thing we see on the modern Ethiopian begena. Another depiction of a similar lyre can be found on the Standard Of Ur, and it also shows a wide, flat, bench-shaped bridge. There are also literary accounts of the sound of the large lyres of Sumer, comparing the effect to the lowing of bulls (clearly suggesting that the strings of the 'algar' buzzed). 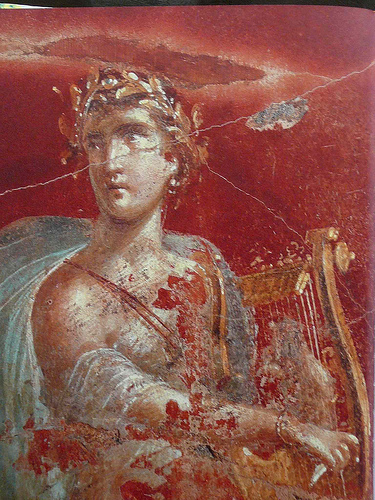 The artist who painted the second fresco above (Pompeii - Woman With Lyre) was not a master painter like the artist who did the fresco in Herculaneum. Notice how "wooden" and stiff the figures look in comparison. The entire work lacks detail and it is impossible to tell much about the musical instrument. Off hand, I would say we are not looking at a buzzing bridge (and I doubt the lyre in the fresco at Herculaneum buzzed either). The bridge was probably made the way it was in order to stabilize it because of the pressure of that Roman whammy bar." "Great to see detail of the Roman period lyres! This a 14 string lyre with pegs, metal tail-piece/bridge with what looks like something like a piece of cloth or leather damping the strings at the top of the lyre too, The darker section on the lyre is hard to work out but the strings are seen tied and the ends dangling loose, very nice detail, the strumming area could be suggesting a boxed area I can see a shadow in front of the tailpiece that could be the actual bridge. I know it was Hundreds of years before this but The Greek writings say their Kithara bridge was rectangular and shaped to an apex, which doesn't preclude a buzzing bridge and there are later accounts of players making their lyres sound like aulos"
THE FUNCTION OF THE TUBULAR STRUCTURES SEEN AT THE YOKE OF THE ROMAN KITHARA? 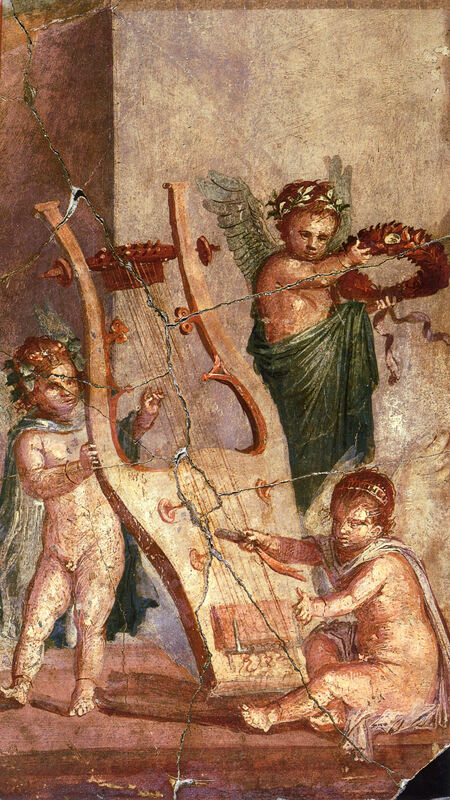 Another really fascinating observation about the various highly advanced kitharas depicted in Roman frescos found at Pompeii and Herculaneum, is the two types of curious tubular structures, extending at a 45 degree angle from the yolk of the lyre. In these particular illustrations, it just might be possible, that these tubular structures could be either a row of permanently fixed tuning levers operated by a tuning key, much like on a modern harp, or even more remarkably, the parallel tubes bear a striking resemblance to a modern harp's sharpening levers - which would enable these kitharas to played in any of the ancient musical modes, without the need to re-tune the whole instrument! "The number of barrels always corresponds to the number of strings on the instrument which strongly suggests that each of them is connected in some way to string function. They are often seen separate from tuning pegs, which implies that their purpose was something other than adjusting the tension in the strings." All the evidence suggests, then, that rather than the modern harp's tuning levers being invented some time during the 17th century, they were in fact, re-invented - Roman musicians were happily using them almost 2000 years earlier! THE FUNCTION OF THE 'APRON' AT THE YOKE ON THE ROMAN KITHARA? Rather than some sort of sharpening lever, like the tubular structures, this 'apron' structure looks very much like some form of shortened fingerboard, which would also enable the seamless playing of accidentals within whatever ancient musical mode the lyre was tuned to! So, how was this 'apron' on these fascinating Roman kitharas actually practically used as a fret during a performance in Roman times? In my opinion, the actual edge of the 'apron' acted as a fret, whenever the string was pushed against it. If, instead, the string was pressed by the finger of the player onto the flat portion of the 'apron', the resulting tone of the plucked string would simply be a muffled-sounding 'thunk'! "...could it be a kind of fixed 'capo' that raises the pitch of the instrument by a tone, and that is engaged by turning the entire yoke by means of one of the handles at either end of it.....? Would this be feasible? Could the apron have had a duel purpose, functioning as both fingerboard AND capo?" "Notice the 6 tube-like shapes that appear to be attached to the yoke, and that protrude forward (in front of the strings) sloping downward at an angle of about 45 degrees. This is exactly the same thing we see on earlier Roman frescoes from Italy we have been discussing above. Entirely separate from these devices, whatever they are, you can see a neat row of tuning pegs on top of the yoke, so we can assume these tubes are not friction pegs. They are something else that we don’t really understand. But the more I study them, the more I think we are looking at sharping levers. Notice also the box that seems to protrude outward at a strange angle to the soundbox. We see this on other artworks as well, but here it appears to be distorted (probably because of the difficulty of adding perspective and fine detail when working with mosaics). It is also worth noting that the yoke is a square dowel, not a round dowel like the kind of thing we see on earlier Greek lyres. The round dowel is only necessary if your tuning system consists of wraps & kollops. Since this lyre clearly has friction pegs, the square shape is far more stable and easier to work with from a luthier’s point of view. Here’s the long and the short of it, IMNSHO. Both the “apron” and the protruding tube devices serve the same purpose: they allow the musician to play sharps. The “apron” is a fretboard system, while the tubes are a sharping lever system. The advantage of the levers, as folk harpists know, is that they change the tuning of the instrument while allowing the player to continue playing with both hands. A fretboard requires one hand to play it, while the other hand strums or plucks the strings." In my opinion, the evidence of this other type of 'tubular structure' (presumably some sort of sharpening levers) on the lyres in the Roman villas in Cyprus, seems to prove that this very specific aspect of lyre design was therefore well established throughout entire the realms of the Roman empire by the 3rd - 4th centuries CE. The 'apron' can clearly be seen just behind the strings on the far right. Presumably, the mechanism worked by pushing one of the tubular structures against the edge of the apron, which would then act as a fret on the string, increasing the pitch of the vibrating string by the required tone, semitone or micro-tone - clever people, those ancient Romans! "Michael, as you can see, I did not put four of the pointy structures on the lyre - I only put two - because they tend to get in the way. As far as function is concerned, the only possibility is that they are caps for sound-holes and are used to mute the volume output of the instrument. The real surprise with the instrument was the so-called “apron” that lies just below the yoke. I believe this was a simple rack for a series of sharping levers. When engaged, each lever raises its corresponding string by one semitone. This creates all sorts of possibilities because they are so easy to use IN PERFORMANCE and are comparable to the keys on a keyboard instrument. 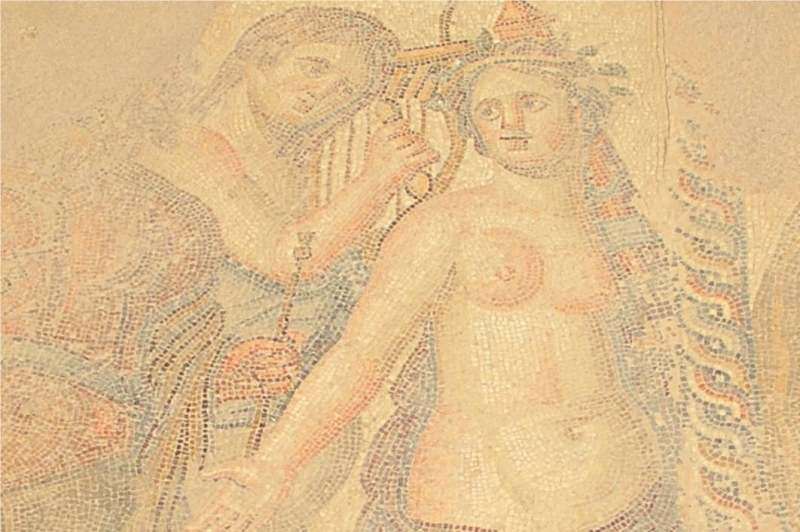 While a sharping mechanism is only hinted at in the Herculaneum fresco, there are many other Roman mosaics and paintings in which the existence of such a device is far more obvious." Peter will be soon putting together a video of his first performance on this wonderful replica Roman cetra to demonstrate all of these features - watch this space! Double course of strings ? - "No double-course intended"
Do tuning pegs imply the use of metal strings? - "Tuning pegs because it's the only way of accommodating so many strings in a close space (triangular arrangement, discussed by Maurice Byrne in the 90's)"
Four tubular structures on soundboard? - "Resonators (ekheîa), yes, perhaps. The celebrated ekheîa were metal resonators built into kitharai." The 'whammy bar' on the bridge? - "Two levers that press the bridge against the soundboard by means of string tension. Definitely not being manipulated by the Cupid - his left arm is situated towards the viewer, far away from the instrument behind. Look at the whole picture, not only the hand! Finally, note how the supposed "mechanism" of the classical Greek kithara is still there, by and large, but here clearly as mere decoration. Which, I have little doubts, it had been at all times." Regarding the 1st century Roman kithara, even though no certain conclusion can be reached in interpreting what these detailed paintings of curious metal 'whammy bars' and 'apron' structures actually are, which are so clearly illustrated on the various Romans kitharas from Herculaneum and Pompeii, I think we can say with some certainty, that these incredibly detailed fresco's shed yet more light on the fact that both the music and musical instruments of the ancient world were far more developed, intricate and complex than the proponents of the "Urban Myth of the Monotony of Monophony in the Ancient World" would have us believe! The same can be said of the hypothetical spring vibrato/portamento mechanism theory to explain the intricate curved structures seen on all the countless illustrations which have survived of the kithara of Classical Greece - although there is as yet no definitive proof discovered of a vibrato technique described in an actual ancient Greek text, it is clearly evident that these structures must have been so carefully designed with a specific function in mind. It is just interpreting this function which is the problem! The most frustrating aspect of interpreting ancient musical artifacts, is that because these wonderful instruments are at least 2000 years away in time from our own present experience of modern musical instruments and have not been played for at least 2000 years, even with all or most of the artifacts present, on some points, all we really have in the way of actually being able to interpret these artifacts, are good old fashioned philosophical argument and counter-arguments - it is rather like expecting an ancient Roman soldier from the 1st century CE to interpret the function of one of our 21st century 'smart phones'! Closing in philosophical reflection, it is this particularly knotty epistemological issue of how we interpret specific sets of facts into something safe enough to be called true 'knowledge' of these facts, which will always lead to all the debates, opinions and counter-opinions within ancient music research!